Sitting rink side at NHL games affords an unparalleled view of the action, especially when someone gets lit up on the boards right in front of you. But now, fans of the San Jose Sharks will be able to recreate that bone-jarring experience in the comfort of their own homes. The Sharks will be incorporating Guitammer's "4D Sports" technology into their home telecasts this season. The system leverages impact data collected from 76 sensors embedded in the boards surrounding the team's ice rink to activate Guitammer's ButtKicker rumble seat—which has been around for some time, but not used in this capacity—in time with the broadcast. Whenever a player goes into the boards, home viewers will feel the blow in real time. 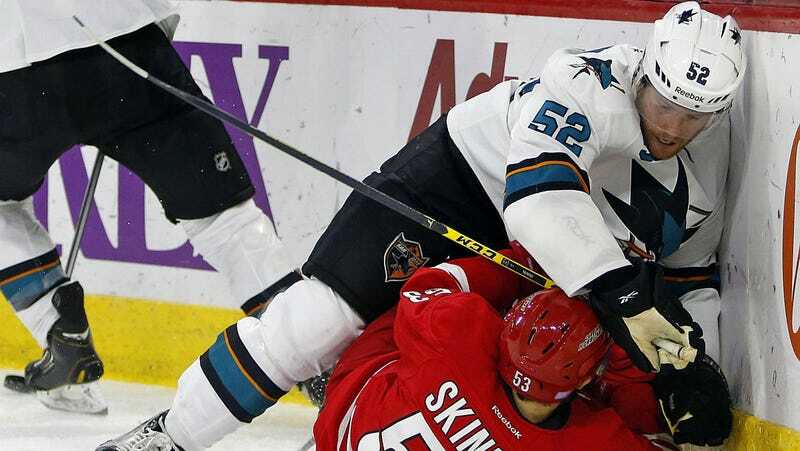 "Our goal is always to bring fans closer to the action, and what better way than to allow them to actually feel what's happening on the ice," David Koppett, a Senior Executive Producer with Comcast SportsNet California, said in a press statement. "Guitammer's 4D technology helps us transmit the electric energy of a Sharks hockey game right into your living room." The technology makes its debut tonight when the Sharks take on the Florida Panthers at the SAP Center. We'll have a hands-on (or rather, butts-on) report once the game starts.